.....You will surely GET it! 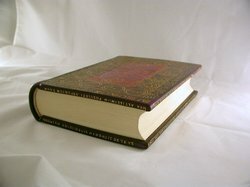 The Grimoire has been blessed and empowered in every part of its construction with the appropriate ancient Latin verse that accompanies each individual seal and sigil during the days and hours of its planet, and is designed to allow designated owners to scribe their innermost wishes in the book and these WILL come true if and only if the wishes are designed to make a difference for OTHER people. 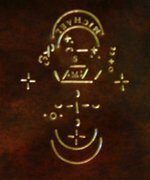 The book is protected and blessed by the powerful entities whose seals and signatures illustrate the book and if someone attempts to use the book in anyway to do evil, then this very evil will be visited on the author of that wish - seven-fold. 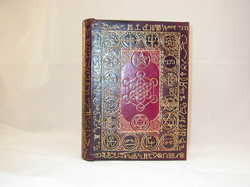 We have received many requests from people to buy a grimoire like this one. 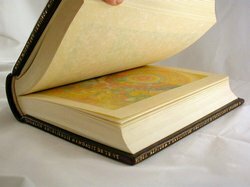 It can only be produced by commission for the serious practioners of the art and is very costly. to the brightness of thy rising"
and long has darkness cast it's shadow over the world. 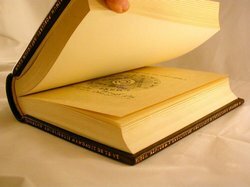 Behold the Arch-Angels, Mightiest of the Mighty are summoned within this book to guide and protect us. and of things to come. 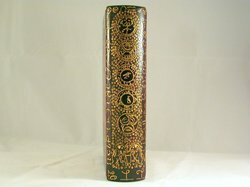 Each symbol on this volume represents the seal or sigil of a being of power and has been made from thousands of tools with 24 carat gold leaf. (Originally, 23 carat gold leaf was used, but failed to 'take' for some totally unknown reason) This is the seal of the Archangel Michael who ranks with, Gabriel and of course, Metatron to guide and protect the creator and owner of this work. To give some idea of the scale of work in each seal, there are 84 individual impressions of nothing more than straight lined and curved tools and handletters to make up the seal of the Archangel Michael. This is the work of many hundreds of hours and was designed to call forth the powers of light, bringing balance and blessings to our World. This is the seal of St Andrew who fought the dragons and is the patron saint of Scotland. He refused to be crucified as Christ was on a + shaped cross and so was crucified as a Martyr on an X shaped cross. This is the seal of Diana, the Huntress, Earth Mother, symbolising the three ages of women. Metatron is an archangel and seraphim who sits at the throne of God. He is one of the greatest of all angels and is represented as the Voice of God. The angel of the presence, chief of the ministering angels, the chief recording angel, chancellor of heaven, the angel by whom the world is maintained, and a being so mighty that he possesses a hundred other names. Few angels have been the source of such a wide-ranging body of legends and tales, but precious few of the celestial hierarchy are credited with such majesty and power. He was supposedly once a humble mortal being, the antediluvian patriarch Enoch. According to widely reported lore, Enoch earned such merit in the eyes of the Lord for his goodness and abilities as a scribe that he was taken to heaven, an event noted in the Book of Genesis (5:24). The Metatronic Cube is reputedly the first geometric symbol that every straight line and curve is born from, this has also become a great symbol of the Qabbalah -The Kabala is an ancient Hebrew mystical system of thought. It is a symbolic representation of the path the Divine followed in the creation of the universe, including man. It is, by definition, humanity's process of returning to divinity along the same path.